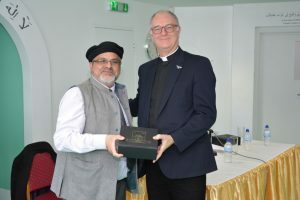 On the occasion of the Bishop of Chichester, the Right Reverend Dr. Martin Warner, visiting the Crawley area, an interfaith meeting was organised by and held at the Ahmadiyya Noor mosque in Crawley. A minute’s silence was held in memory of the New Zealand atrocity. 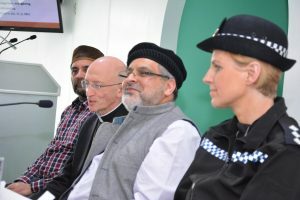 The Bishop, along with a number of other speakers, addressed the meeting each expressing in different ways their commitment to peace and working together to resolve social issues that we are faced with in society today. 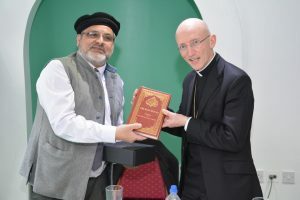 Bishop Martin stated that “When faiths get together in this way they are a force for good. 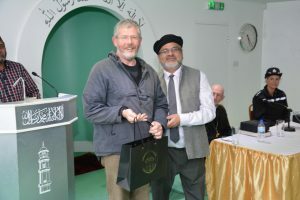 I have been extremely humbled and honoured with this gathering and the openness, warmth and love of the Ahmadiyya Muslim Community (AMA) here at the Noor Mosque”. 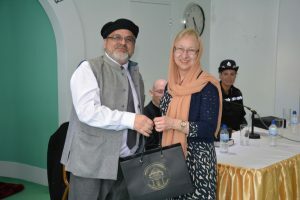 Commander Rosie Ross welcomed all community initiatives to get people involved in tackling the social and moral issues behind such problems as knife and gun crime. 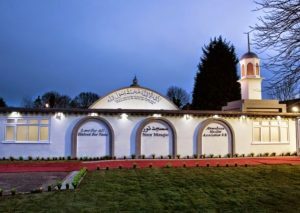 When the mosque was inaugurated in 1994, His Holiness, Mirza Masroor Ahmad, world head of the AMA stated, ‘The mosque should be a beacon to promote love in the community and its neighbours should never feel threatened. 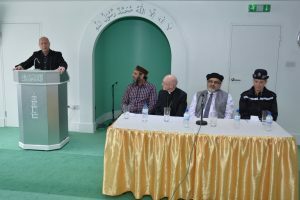 It should be a mosque where members of any and all faiths should be welcomed””So today“, “Mr Ahmedi stated, “having the honourable Bishop and other faith communities with us today and praying for peace and remembering all who have been victims of terrorism from evil acts is keeping to that promise. 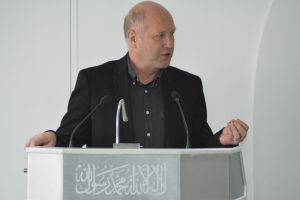 Noor Mosque indeed has been a beacon to promote the message of Islam, ‘Love for all, Hatred for none”. 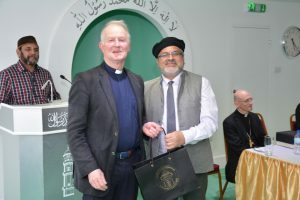 All Faiths Director, Martin Weightman, spoke of the human rights values inherent in religions well before there was a coherent body of human rights standards which were adopted as the Universal Declaration of Human Rights in the 1950s emphasising that these are the values we shall build upon and that when destructive acts are done, falsely, in the name of religion, it is nothing more than a perversion of these values. 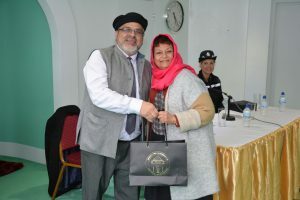 The meeting was rounded off by presentations, given by Mr. Ahsan Ahmedi, Regional Ameer of the Ahmadiyya Muslim Association, to different community leaders recognising their commitment to improving conditions and working together.